Smugglers’ Notch Resort in Vermont sponsored the Back to Ski campaign in 2013 and we’re thrilled to have them back as a sponsor. One of the things that Smuggs (as it is affectionately known) prides itself on is all its offerings for the littlest of skiers. Adrienne Veglia Mazeau of Wandering Working Mom talks about her kids’ first skiing experience as part of Smuggs’ Snow Sport University. Our visit to Smugglers’ Notch was the first time I donned a pair of skis in years. But more importantly, it was the first time our kids, ages 3 and 6, ever tried skiing. You can say I was pretty nervous about how the long weekend was going to pan out but I really didn’t need to worry about a thing. Smuggs has perfected family ski trips into an art form and is the place to teach your kids to ski in the northeast. Although it was unseasonably cold for December, we had made arrangements for the kids to take two full days of lessons through Smuggs’ Snow Sport University. My son was part of the Dynamic Dynamos which was targeted for kids ages 3 to 5 and offered a full day ski experience with easy transportation (a brightly colored, tractor-pulled wagon) to the base of Sir Henry’s Hill as the learning slope is called. This tractor ride can probably make or break some kids’ experiences as little ones don’t have to awkwardly walk from the meeting place to the slope; it was a huge bonus for my son and definitely enhanced his day on the mountain. 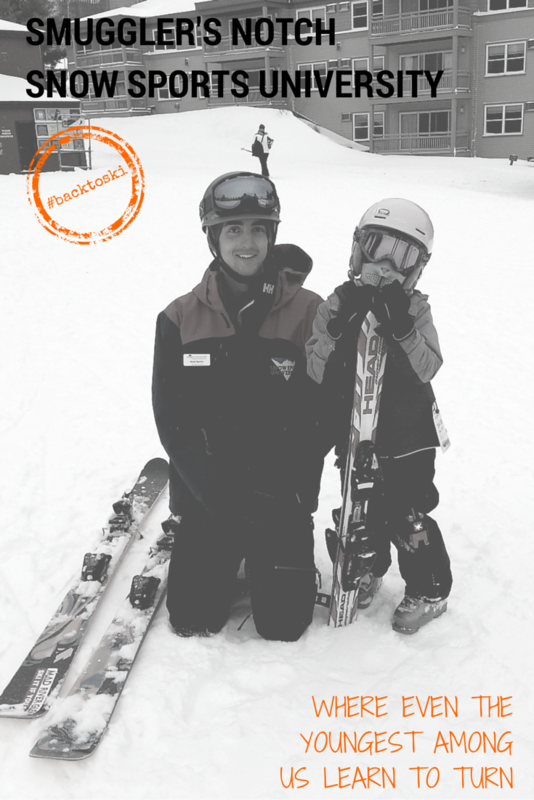 At this age the kids learn to ski with age appropriate games and several indoor breaks. The Dynamic Dynamos even start the day indoors with instructors teaching the kids how to put their skis on and allow them a chance to walk around in their boots. I truly think the skill to work with this age group during that awkward first experience on skis can be intense and all of my son’s instructors were excellent and patient. My son still hasn’t stopped talking about his skiing experience at Smuggs. Both the Dynamic Dynamos and Adventure Ranger programs at Smugglers’ Notch Snow Sport University run from 9:00 a.m. to about 2:30 p.m. and include lunch and plenty of time inside if needed. For parents looking for a little more time on the mountain, kids can participate in an afternoon activity until 4:00 such as science time, movies, and crafts. My kids actually cried when we picked them up at 2:30 as they wanted to stay for the après-ski fun! 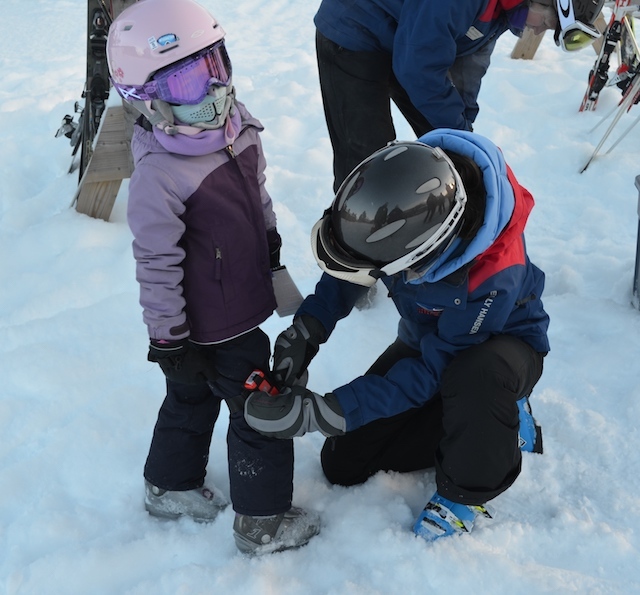 For the coming season Smugglers’ Notch is fine-tuning their ski school program even more and targeting the youngest skiers ages 3 to 4. I’m excited for this change as it really adds an emphasis on the emotional needs of preschool age children who are putting on a pair of skis for the first time. The full-day program allows kids to connect with the instructors to foster a more positive relationship. In addition, a new program will launch this winter geared for 5 to 6 olds called Trail Blazers. This level will incorporate the unique budding independence of this age group, along with their more pronounced coordination and willingness to try new things, into an all-day ski camp or two-hour lesson. Not to be missed for families with up and coming snowboarders is the Burton Riglet Park. This state of the art facility provides kids age 3 to 6 with various programs to introduce them to snowboarding on kid friendly terrain features to guide the learning experience. Kids can take part in the Snowboard Discovery Camp, private or group lessons or a unique mommy/daddy-and-me ride class. 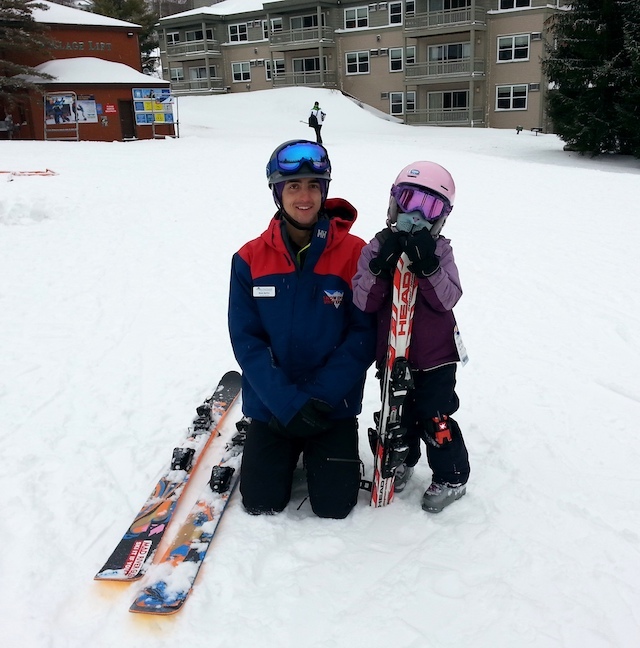 Ski school programs can be expensive; however, the investment you are making in your child’s ability to fully learn to ski is immeasurable and will be well worth it in the long run. Plus, Smugglers’ Notch, like many resorts, has package deals that include accommodations for big savings on family fun. Want more information about the programs and amenities offered at Smuggs? Read more about Adrienne’s trip to Smuggs at the All Mountain Mamas website. Check out this dad’s story about how a visit to Smuggler’s Notch upped his cool factor. See why Mara thinks Smuggs is the perfect place for families. Sign up for the Smuggs enewsletter to get information about their programs. All photos courtesy of Adrienene Veglia Mazeau.